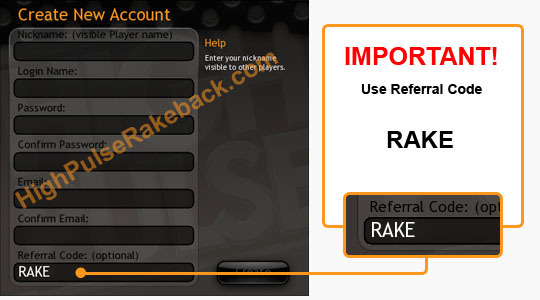 This guide will help you to create a new rakeback account at High Pulse Poker. Registration process is simple and takes about 2 minutes. After the registration you will be able to start playing immediately. Note that you must follow this guide to become a member of HighPulseRakeback and participate in our private promotions. 1) Clear Your Browser's Cookies. 2) Download High Pulse Poker using This Link or use Download button below. It is important that you use given links for downloading because only these links will track you to High Pulse Rakeback properly. 3) Install High Pulse Poker to your computer. 4) After the installation is finished run High Pulse Poker. Choose “Poker Lobby” and then “Create Account”. If you do not send your Nickname at HPP to our e-mail you will not be able to participate in our private promotions. (Because we will not be able to notify you) Please, use valid e-mail address. Add our e-mail to your address book to receive our e-mails without troubles. Congratulations! You are a member of High Pulse Rakeback now! You can take part in all our private promotions. Good luck at the tables.